This is the handle from the top selling Muhle R106 Safety Razor. It is compatible with all 3pc Muhle safety razors and many other brands too. The handle benefits from a sleek black finish with contrasting chrome. Surprisingly, when wet the R106 handle manages to deliver a really good grip better in fact than all chrome finished handles. Match up with the chrome plated Muhle Safety Razor Stand. Use with a variety of 3pc safety razors. Don't overtighten the handle to the head, when you feel it making contact with the head give it the tiniest of nips to secure. If you overtighten the handle you will strip the thread. 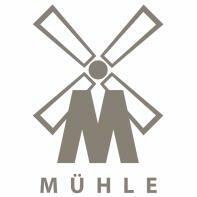 We are huge fans of the Muhle brand, they make well constructed pieces that feature fuss-free, simple lines.